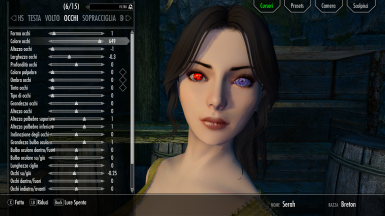 This is a preset.jslot and head sculpt which should work with "The Uchiha Clan" mod and should fix misaligned mixed eyes such as Sasuke's Sharingan-Rinnegan or the left eye blindness as well as any other eye texture mod which uses "eyefemaleleft.nif" and "eyefemaleright.nif". She was looking a bit to her right. Fixed. Adjusted face dimensions to be more anime-like. Now the default hair is Quantum. Import the .jslot preset first and then the head sculpt otherwise it won't work, even if you import the head sculpt with the body weight set to 50. ﻿Remember that if you use any altered head mesh like citrus head it won't work. 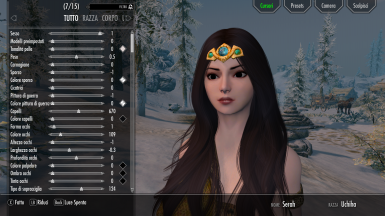 Even if you should use it with Race Menu (I don't know if tihs works with ECE since I don't use it), I'd suggest to use the "femalehead.nif" mesh provided by "Enhanced Character Edit", but any other head mesh based on the vanilla one should be fine.